How Twitter Can Predict Heart Disease (NASDAQ: TWTR) - 24/7 Wall St.
Can Twitter Predict Heart Disease? In a study about how activity on the social media network run by Twitter Inc. (NASDAQ: TWTR) can predict health outcomes, researchers found tweets on the network can predict heart disease patterns. Perhaps the research will replace more expensive and traditional approaches used by organizations like the CDC and work by major universities. If so, the cost of predicting health outcomes could shrink. However, the report is a bit of voodoo science, and thus has little value. Previous studies have identified many factors that contribute to the risk of heart disease, including behavioral factors like smoking and psychological factors like stress. 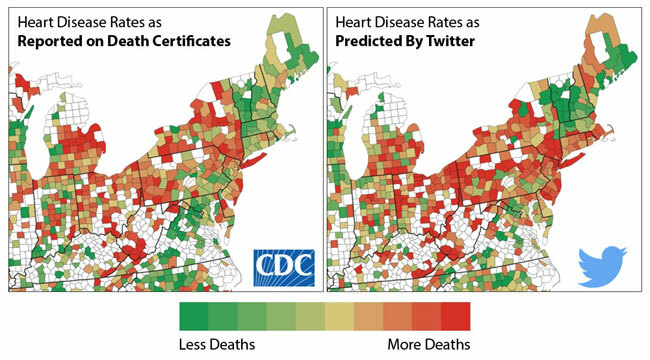 Researchers from the University of Pennsylvania demonstrated that Twitter can capture more information about heart disease risk than many traditional factors combined, as it also characterizes the psychological atmosphere of a community. The findings show that expressions of negative emotions such as anger, stress, and fatigue in the tweets from people in a given county were associated with higher heart disease risk in that county. On the other hand, expressions of positive emotions like excitement and optimism were associated with lower risk. The researchers found that negative emotional language and topics, such as words like “hate” or expletives, remained strongly correlated with heart disease mortality, even after variables like income and education were taken into account. Positive emotional language showed the opposite correlation, suggesting that optimism and positive experiences, words like “wonderful” or “friends,” may be protective against heart disease. Limitations of the method’s predictive power include the social factors that influence what kinds of messages people choose to share on Twitter. Who need scientists and health care officials? Apparently, no one.